LOS ANGELES, CA, August 22, 2016	(Newswire.com) - ​​​​Patch of Land, a leading online marketplace lender for real estate, and its community of accredited and institutional investors, is participating in the single family rental (SFR) market in Utah through a series of cash flowing, stabilized and diversified portfolios. Investors are participating in a total offering of $4 million to refinance a portfolio of 36 properties in the Ogden and Salt Lake City metro areas, which have been renovated and have rental tenants in place. Structured as four 24-month loans, investors will receive 10% and 10.25% interest paid monthly. 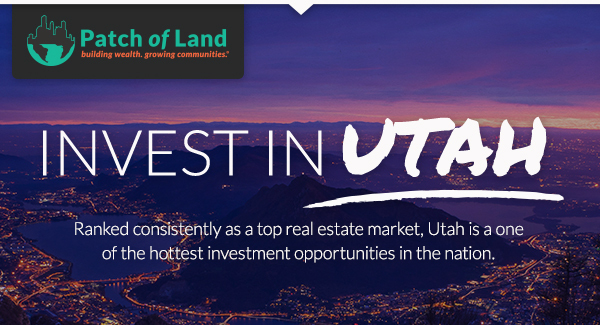 The sponsor, Blue Mountain Inc. is a real estate investment provider with 10+ years of experience in the Utah real estate market running a fully integrated turn-key operation: buying, renovating, leasing and managing single family properties. ​Patch of Land is a national real estate marketplace lender that uses proprietary technology and data to provide transparent, scalable, and efficient lending solutions. Patch of Land offers borrowers access to reliable capital for residential and commercial real estate projects, while providing investors easy diversification into real estate with low minimums and a best-in-class secured loan structure. For more information, please visit PatchofLand.com.